Following up their debut album A Tragedy in Steele, Rebellion is back with their sophomore album, Born A Rebel. If you're familiar with this band, you know that this is the band formed by ex-Grave Digger axeman Uwe Lulis. Unlike the band's first album which was a narrative of Shakespeare's Macbeth, Born a Rebel is a straight forward metal album. The straight forward sound of this album seems a much more comfortable fit for Uwe. Naturally, the songs on the first album were crafted around lyrics and spoken narration telling the story of Macbeth. This time around, the guys crank out some hard hitting metal tunes without the obvious restraints that a concept album such as the debut album poses. Uwe is much more generous with his riffing, and as a result the songs are much more potent and hard hitting compared to the debut. Some of Grave Digger's finer moments such as Excaliber come to mind when listening to Uwe shred on this album. The vocalist has a very rough delivery, which is a great fit for this aggressive, in your face style of metal. However, his limited range does hinder his ability to emphasize the melodic aspects of their music. For example, the mid-tempo track, One For All and the Viking inspired Dragon's Fly sound a bit odd with rough aggressive vocals. A more subdued vocal delivery would have helped, as he seems to sing at full throttle regardless of the tempo. 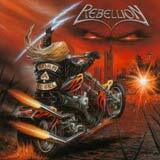 Heart pounding heavy metal tunes are unquestionably what Rebellion does best. Born a Rebel is certainly a very good metal album, but it does tread in very familiar water. The melodies are rather mediocre, which makes the songs less memorable on an individual basis. The album does lack originality, but the musicianship of the band (especially that of Uwe Lulis), picks up the slack. Having said that, fans of traditional heavy metal acts such as Accept, Grave Digger, Running Wild and fans of Uwe Lulis in general will be the most pleased with this album. As with the debut, the production on this album is also crisp and very well done. Born a Rebel probably won't become one of your favorite traditional metal albums, since many bands have covered and continue to cover this territory almost flawlessly. However, the guitar work alone is enough to make this a satisfying listen.